Driver License Information - Jacoby's Auto Tags & Ins. An ID card is a viable source of identification offered to individuals 10 years of age and older who may or may not have a driver's license. To apply for an ID card, you must appear in person at one of the Driver License Centers and present proof of identification and residency requirements. If you have an out-of-state driver's license or ID card, you will need to surrender it at the time of application for a PA ID card. All new residents with out-of-state CDL’s must obtain a PA CDL within 30 days of establishing Pennsylvania residency. To apply, you must appear in person at one of our Driver License Centers. You will be required to surrender your out-of-state CDL (valid or expired six months or less) before PennDOT can issue you a PA CDL. You will need to take a vision screening test and complete the necessary forms, which are available at the Driver License Centers. In addition, you will need to show proof of identity and residency. Jacoby’s Auto Tags & Insurance can issue Pennsylvania Special Fund License Plates Instantly. Just come into our office with your current Registration Card or your current vehicle information (Plate # or Vin #) and we can issue you one of the State Special Fund Plates (Displayed at Bottom). You will also be required to show your current Pennsylvania Drivers License to establish your identity. Jacoby’s Auto Tags & Insurance can also help you obtain a Personalized License Plate. A Personal License Plate gives you the opportunity to pick a combination of up to 7 letters and numbers to be printed on a custom made License Plate. 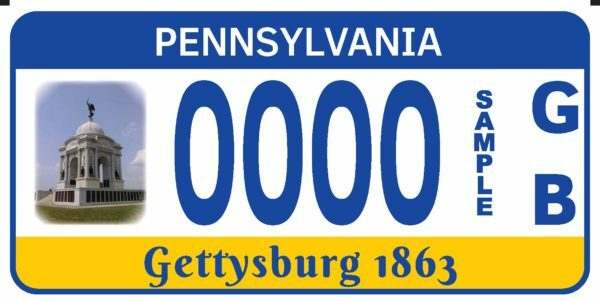 Express your individuality with this popular Pennsylvania Plate option. Use the Custom License Plate Checker to see if your selection is available.